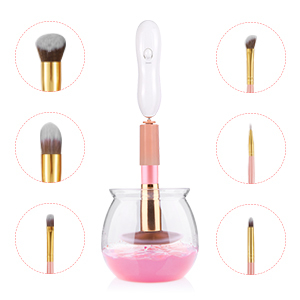 Deeply Cleaning and Healthy Skin This cleaner tool can depth clean makeup brushes, not only to remove cosmetics residue,but but bacteria, oil, dirt, and dead skin as well. No Harm to Brush Keep your brushes always in perfect form. Extends life of your brushes by keeping them clean and soft. Saving your time and money. 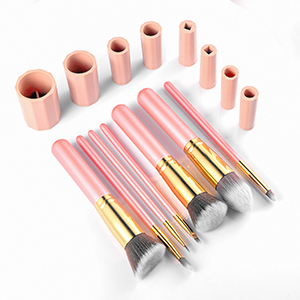 8 Kinds of Different Brush Collars 8 different sizes to fit different brushes, suitable for 95% makeup brushes in the market. which means you can clean many brush sets. Top Quality and Perfect Gifts Elegant, top quality, low-vibration design.Stylish package,a perfect gift for makeup lovers.Enjoy healthier and more beautiful skin. More Healthy Beauty Way Say goodbye to wash brush with hand. 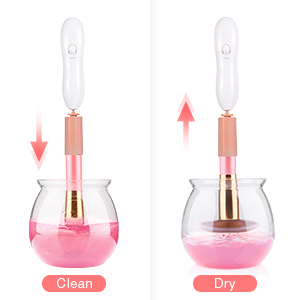 Fast clean and dry your brush in 1 minutes with electric makeup brush cleaner, more neat and tidy. Makeup brushes should be cleaned at least twice per month, not only to remove old makeup, but bacteria, oil, dirt, and dead skin as well. Eyeliner brushes should be cleaned even more frequently to prevent eye infection. 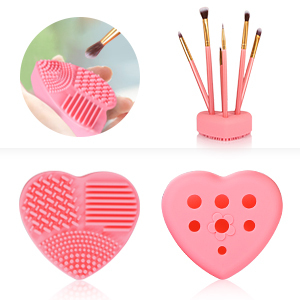 It come with free cleaning mat, portable and cute, also cleaning your brushes. How to clean: 1. Put some water and soap or baby shampoo into the bowl. 2. Find the suitable collars and insert the brush into the spinner. 3. Dip and dunk the brush in the liquid for 10s. 4. Turn on the spinner, spin the brush to clean. 5. With clear water and clean again. 6. Spin the brush to dry it about 20s. 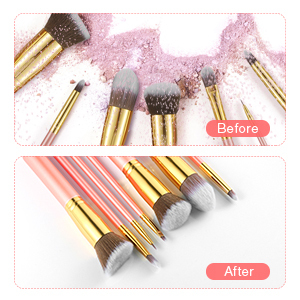 8 different sizes collars to fit different brushes, suitable for 95% makeup brushes in the market, which means you can clean most size brushes. Made from high grade materials to ensure long-lasting use. It is nontoxic and easy cleaning. This automatic cleaner can clean and dry makeup brushes in 30 seconds, removing all bacteria, cosmetic residue, dirt and oil from your brushes.